A study that looks at the true cost of homes found that transport plays a major role in affordability. Photo by Travlr. The District of Columbia Office of Planning, in cooperation with the Chicago-based Center for Neighborhood Technology, released a study that found transportation costs range from $8,500 to $25,000 per household in the D.C. region. The report, “H+T in DC: Housing + Transportation Affordability in Washington, DC,” investigates how neighborhood characteristics, such as proximity to jobs and access to transit, vary across the region and affect household transportation costs. According to the study, transportation costs can be lower if neighborhoods enable their residents to live without owning a car. 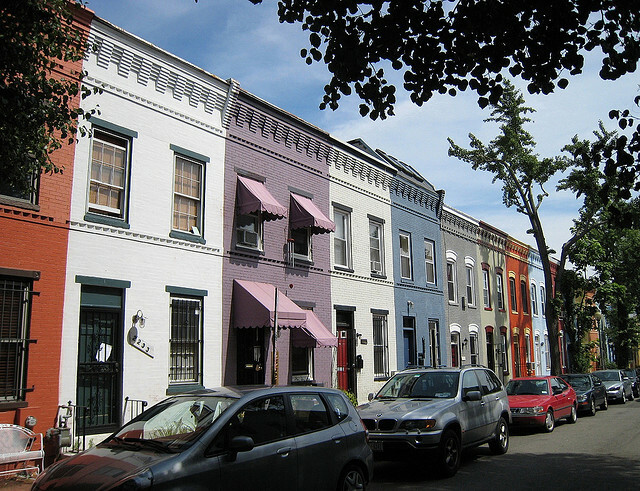 The D.C. study is based on CNT’s Housing + Transportation (H+T®) Affordability Index, a value that uses U.S. Census data to examine how neighborhood and household characteristics affect transportation costs, such as car ownership and transit use. The model was developed with the help of the Brookings Institution’s Urban Markets Initiative. Along with the help of the Rockefeller Foundation, the Index model has been applied to 337 metro regions in the United States to measure the true affordability of housing by calculating the transportation costs associated with a home’s location. The Index does not only look at commuting to and from work to calculate transportation costs. It also includes travel that is part of the household’s daily routine. This Index includes six neighborhood variables: residential density, gross density, average block size in acres, transit connectivity index, job density and average time journey to work. There are also three household variables included in the calculation: household income, household size and commuters per household. When these nine variables are combined with car ownership, car usage and public transit usage, the ensuing value is the total transportation costs of a household. By including these variables, the study shows how decisions in land use planning, like incorporating mixed-use and transit-oriented developments, can affect household transportation costs for a neighborhood. The study’s findings can be helpful in attaining the goals of “Region Forward,” a report by the Greater Washington 2050, a coalition of public, business, civic and environmental leaders to improve the quality of life for Washington area residents over the next 50 years. One of Region Forward’s goals is to make sure average household housing and transportation costs in major job centers do not exceed 45 percent of the area median income. Since the first phase of the H+T Index was released in January 2006, the calculations rely on data from the 2000 Census. CNT is planning to update the Index using the most recent American Community Survey data from the Census Bureau. Watch Director of the Office of Planning Harriet Tregoning discuss planning initiatives for D.C. during the Intelligent Cities Forum at the National Building Museum. Tags: accessibility, affordable housing, housing, housing prices, housing values, mass transport, Mixed Used Neighborhoods, mixed-use, North America, public transit communities, public transportation, smart transportation policy, transit policy, transit-oriented development (TOD), transport, transportation, transportation culture, United States, urban transport, urban transportation, Washington, D.C.